Unbeknownst to me, Stephane desperately wanted an iPad. So, he did what he always does when he secretly wants a new gadget - he asked me if I wanted one. When I said that I didn't need another technological distraction, Stephane changed tactics and suggested that we give an iPad to Philippe as a graduation gift. Imagine his disappointment when our son responded that he didn't want one either. Darn, foiled at every turn! As it turned out, Philippe declined Stephane's offer because he wanted to give us a present to say "thank you" for the four years that he spent at Boston University. After rubbing our ears in disbelief, we gladly accepted an evening of Shear Madness! Listed in the Guinness Book of World Records as the longest running non-musical play in the history of American theater, the cast of the hilarious whodunnit murder mystery invites the audience to spot clues, question the suspects and solve the crime. Totally convinced that Tony was guilty of murdering his upstairs neighbor, Stephane was the lone person in the audience to raise his hand when we were asked if we thought that the male hairdresser was the culprit. Peering at Stephane from the stage, Tony expressed his dismay that my Swiss husband would so easily convict him of the crime and delighted us all by saying that he hadn't recognized Stephane at first because he looks so different with his clothes on. It was improvisation at its best! As the outcome is never the same because it depends on the characters' interactions with the audience, I'm fairly sure that Stephane's next idea will be to take Philippe to see "Dernier Coup de Ciseaux" in Paris. 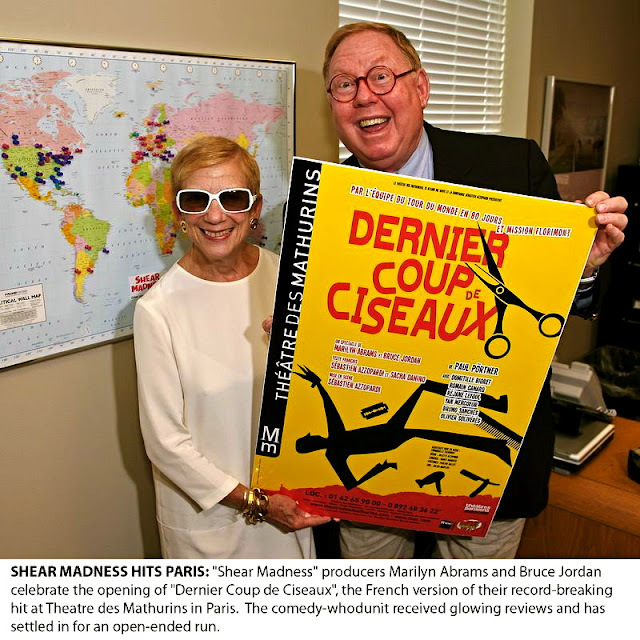 Translated in ten foreign languages and playing in cities around the world including Barcelona, Buenos Aires, Madrid, Rejkavik, Rome, Tel Aviv, Melbourne, Johannesburg and Seoul, there's a good chance that you can join the more than 9.6 million people who have already experienced Shear Madness! Thanks for an unforgettable evening, Philippe. Laughter helps keep the heart young! I cannot believe that SM is still playing! I have gone several times in the past and it was ALWAYS different and lots of laughs. Boston is such a cool town. Is "The Proposition" still playing in Inman Square? That's another great Boston experience. Enjoy your last few days there and perhaps we can meet up (with Denise) in the Fall?? I don't know if "The Proposition is still playing. Nothing recent turned up when I googled it but I'll ask Sara and Philippe if they've heard anything about it. As a BU alum, you probably already know that the Charles Theater was the home of "The Actors Company", a group of BU graduates including Olympia Dukakis. The name originated from the group's first home at 54 Charles St. I liked finding out about the BU connection since we went there as part of Philippe's graduation celebrations. Oh! nycgirl followed your recommendation to go whale watching with her mother and husband today. I can't wait to hear if they saw some! It would be great to get together if you, Denise and me are all in Boston at the same time this Fall! But wait! Stephane didn't get his iPad? Now, that's sheer madness. Actually, I don't have one either, I'm like you, I just don't need another device (and I'm not even of twitter, although I do have a FB page--hey, you were supposed to learn how to use FB while you were in the States). Maybe if Stephane just downloads an Angry Birds app he'll be happy. I've not seen Sheer Madness, but I've always been intrigue by improv. So glad you did this. Other than setting up an account, I still haven't made any progress with FB. I was planning to ask one of our kids for some help but our time in the States passed much too quickly. Sad to to say that it is "au revoir" - we're at Boston Logan waiting to board the plane to Paris. It's still playing at the Kennedy Center in DC where I saw it when I was in high school over 30 years ago! It's a big hit with the tourists. That's good to know that it's showing in DC! For some reason, I never thought about going to a show/concert there. I really should since it's so close to Annapolis. How fun!!! I love interactive theater! It sounds like you all had a great time. I'd love to see the show in Paris! So what's with men and their iPad guilt?! LOL! Seb pulled something like before he bought his iPad too, justifying the purchase by saying that it's "our" iPad. It's been a month and I have yet to use it, and just like you, I don't want to. I'm impressed/surprised that Phillipe didn't want one. Ha! Stephane tried the "it's our iPad" propaganda when he came home with one in Annapolis. And like you, I have yet to use it! After having such a good time at the show in Boston, we plan to go to "Dernier Coup de Ciseaux" in Paris before it ends on Sept. 1. Stephane likes the idea of watching the show and interacting with the actors/actresses in his language. Who knows what faux pas I'll commit! Yes!!! Stephane is the proud owner of an iPad! I'm sure that I'll like using it as well...that's if it's ever out of his hands for any length of time!